Click on the video below to view the video tutorial. Otherwise, continue scrolling down for the written steps. Login to your Formilla account and click Settings from the left menu. On the following page, click Canned Messages from the sub-menu on the left hand side. Click on the grey button labeled Add Canned Message. In the “Message” section is where you can type out the full message that you want displayed. Tip: You can personalize the message to your customer by adding any of the features below the “message” section. For example, if you would like for the message to include the customer’s first name, you can type your message and select the corresponding visitor variables such as, “Are you still there, [First Name]?” and press save. When using the canned response during a chat, it will then pick up on the customer’s first name and display it into the message automatically if the info is available during the chat. Another tip: After you have responded to a customer with a full message and decide that you would like to use that message as a canned message, you can simply click on the blue plus sign (+) icon, right above the message. You can type “#” followed by the shortcut word you created. To continue with our example above, you would type “#hello” and the full message will appear. You can access the canned messages menu by clicking on the little icon to the left of the entry box with your mouse. Now it’s your turn! The canned messages feature comes with all Formilla Premium accounts. Add as many shortcuts as you will find helpful. 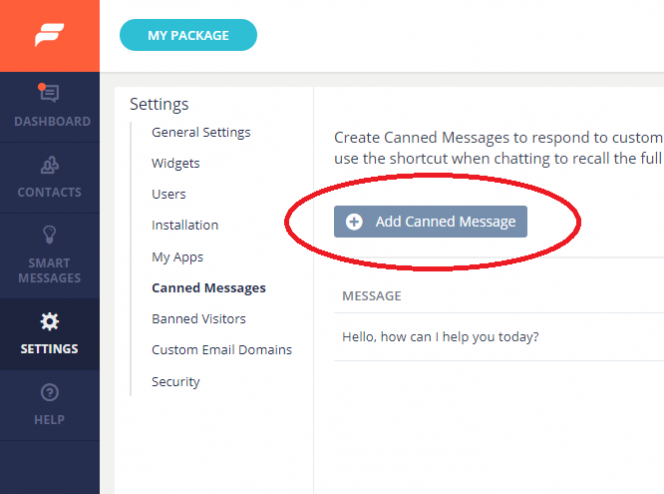 We’re hopeful that the canned messages feature will save you time and energy! As always, please contact us if you have any questions as we’re always willing to help!